Leaves behind a glossy mirror like finish! The Sonax EX 04-06 is a medium cutting polish that finishes down like your favorite finishing polish! This allows you to remove light to medium imperfections, while finishing the paint down to that mirror like shine we all strive for. This unique formula was created specifically for use with dual-action or random orbital polishers and the abrasives break down consistently to help you produce the high amounts of depth and gloss. EX 04-06 is water based and contains no solvents, silicones or petroleum. The dust free formula allows for easy clean up and prolongs the life of the polishing pads. EX 04-06 works great as a one step polish and if you have heavy imperfections, we recommend starting off your polishing with the Sonax CutMax and following it up with the EX 04-06 to finish the paint down. 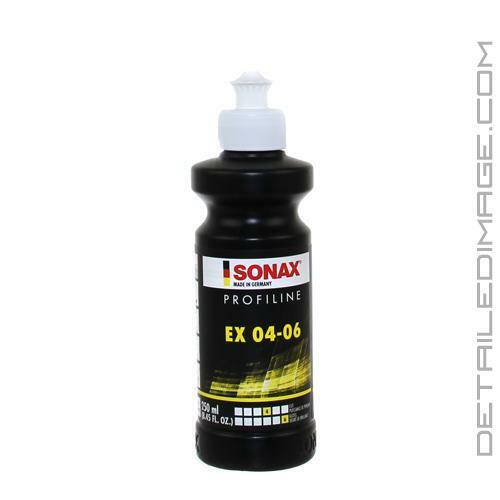 Grab the Sonax EX 04-06 today and bring your paint back to life! If necessary, sand flaws with P2000 sanding paper or finer. Apply product to SONAX Polishing Sponge 160 Medium (493000). Begin polishing using maximum 10 lbs. Wipe clean with a SONAX Microfiber Cloth ultrafine (450700). This is a great polish that provides a decent amount of cut with a very high gloss finish. Sonax Perfect Finish is said to be the best overall polish on the market by many pro detailers including myself, and the Sonax 04-06 is very similar to Perfect Finish for a lower price. 04-06 was formulated to be used with Dual Action polishers and Perfect Finish was formulated for Rotary polishers. I have found that they both work great on any machine. The only difference I can find using 04-06 and Perfect Finish is the 04-06 is very slightly more difficult to remove. Since that is the only user difference, I generally use the 04-06 more often because of the value for money. Both are amazing products. Sonax 04-06 is an excellent 1-step polish which really does take down medium imperfection and all swirls, and does it quickly. You have to learn to not use too much product, or it will start taking longer to correct sections. Just 3 to 4 drops on a 6in Rupes Yellow pad. This is a great combination - really reduces correction time. After spreading on low speed, bump speed up one notch and use 10lbs pressure for one or two passes on 16in x 16in section - with slow arm speed. Then bump the speed faster and two more passes with light pressure to finish. Wipe off and all swirls should be gone. I have 2015 Nissan in Jet Black and this product allowed me to finish a whole side in 2 hours vs. 4 hours on the other side with ChemGuys 3-step 34, 36, 38 polishes. This polish also took out medium imperfections without having to resort to a compound. Better first-time results than Optimum Hyper Polish. Faster than using Menzerna 2500, then 3500 in a 2-step process. Big time savings and great finish. Just remember NOT to overuse product, and to change pads often - I suggest 1 pad per door panel for instance. If you get product/clear coat build up on the pad your time efficiency and results go down - with any polish.